Through this widely-popular, best-selling debut that was successfully made into a movie, Stockett had told such a compelling story which highlights the racial status in America in the early 1960s. It was set on Jackson, Mississippi, a state that was controversial with the racial issue. The book was told from the eyes of three different persons with strong characters that vocalize not only their dialect, but also their thoughts, which sets perfectly into such a heart-warming tale. Skeeter Phelan, a white freshly graduate college student, was determined to be a writer living in New York, a heaven for writers like her. First she inquired for a position in Harper & Row publishing house, with such an ambition, despite the fact that she had zero professional background. Expectedly, the editor declined her inquiry, but with one exceptional thing, she could change her mind if she could come up with her best idea. As the story paced, Skeeter’s life was entwined with Aibileen Clark, a black maid that works for her own best friend. It was not until she got the job writing Miss Myrna – the weekly cleaning advice column – when she got the idea for writing the book. She spent her days writing the column with the help of Aibileen, answering all the questions she got from the reader about housekeeping. The thought was ridiculous at first, knowing it was way too risky, writing a book about the daily life of black maid working in the white homes. But it was hope; a tiny spark of hope – that started all of it – for change. Then we met Minny Jackson, unlike any other colored maid, she got the guts to stand up for herself. Although, sometimes it flickered problems for her own, as it was one of the reasons why she agreed to volunteer her own stories for the book. Yet, the editor of the book, Elaine Stein, herself described her as “every Southern white woman’s nightmare. I adore her.” No wonder she did. Despite her character itself that stands out from this book, she had a crucial part for the story. Both Minny and Aibileen, were such lovable characters. Aibileen had motherly figure that was portrayed beautifully, through her job that was more as a baby sitter rather than a maid. She was left by her own husband, and her life was haunted by her past. On the other hand, Minny was more thick-headed and big mouth, as a result of having drunken Daddy and abusive husband, that is. She got six children to look after, and it was not an easy job. Even though both of their lives aren’t that pretty, they managed to overcome their own problems with wise and big attitude. 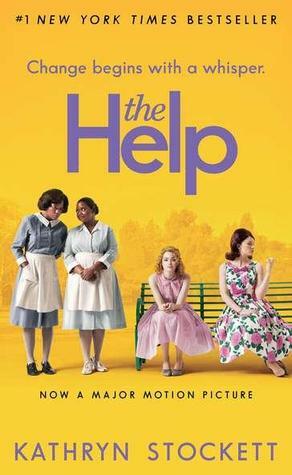 Told in witty and charming narrative, The Help captures the heart of the readers, through good old-fashioned way. And what is the point of writing the book? It is for woman to realize, We are just two people. Not that much separate us. Not really as much as I’d thought. The Help taught an important life-value that there is no line between colored and white people, nor does it appear between any human being in this world. Stockett left an ending, the same way as she started; with hope.